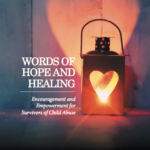 The Children’s Advocacy Centers of Georgia has published a one-of-a-kind resource for survivors of child abuse titled, “Words of Hope and Healing: Encouragement and Empowerment of Survivors of Child Abuse.” Along with forewords by National Children’s Advocacy Center Executive Director Chris Newlin, CACGA Consultant and former National Children’s Alliance Executive Director Nancy Chandler, and “Jane Doe,” a mom whose child was served by a Georgia CAC, the chapters that follow were all written by a director of a Georgia CAC. In this book, our directors from across the state of Georgia have written about hope, encouragement, and empowerment. They have imagined through their writings what it would be like sitting with a child and non-offending caregiver on their final day at the CAC when a child asks: What now? What is my life going to be like? What happens to kids like me who’ve had things like this happen to them? How can I be successful? How can I trust? How can I love? Who cares about me? Or any number of the many questions that have been asked by children over the years. The result is a powerful book rich in words of hope, healing and encouragement from dedicated and professional advocates who see, and serve, children who allege abuse, neglect, and exploitation every day. Our hope at CACGA is that every child and family who is served by a CAC, upon leaving our services and transitioning back into the journey called life, be given a copy of this book so that they can continually review and reflect upon these powerful words of hope and healing. We also hope that anyone who suffers from any trauma, regardless of its cause, be given this book for its source of positive and productive influence. For the latest news on what's happening at CACGA, subscribe to our monthly email. When you want your gifts to really matter, there's one gift you can always count on to save the day - it's the gift you give to the Children's Advocacy Centers of Georgia. Georgia is accredited by the NCA! CACGA is supported in part by the Georgia Department of Human Services, Division of Family and Children Services and the U.S. Department of Health and Human Services, Administration for Children and Families, Temporary Assistance for Needy Families (CFDA 93.558). Points of view or opinions stated in this document are those of the author(s) and do not necessarily represent the official position or policies of the Georgia Department of Human Services, Division of Family and Children Services or the U.S. Department of Health and Human Services, Administration for Children and Families, Temporary Assistance for Needy Families (CFDA 93.558).